A witness in the Railtrack case at the High Court has said the government was prepared in 2001-2 to pay the firm's shareholders £1bn to "go quietly". That was the claim of former Rail Regulator Tom Winsor in the second day of the trial. 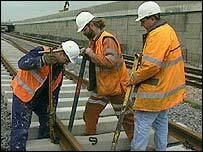 The case revolves around whether the government plotted Railtrack's demise in 2001 by refusing it extra money. About 50,000 Railtrack shareholders have launched a claim for £157m in compensation from the government. They allege "misfeasance" - that the government and the then Transport Secretary Stephen Byers acted within the law but in bad faith - and a breach of human rights for confiscation of assets. The government says it did not engineer the collapse of the company. It has always said the firm was not capable of running the railways and was insolvent without government support. Mr Winsor's written statement to the High Court - which was unchallenged - said the government was prepared to pay Railtrack shareholders a total of £1bn to accept the demise of the company. He said he was told this fact by Mr Byers some four months after Railtrack went into administration in October 2001. In the end, the £1bn was not necessary as the firm willingly co-operated in the petition putting it into administration. Mr Winsor further alleged that if he had known that Railtrack going into administration was a real threat, he would have tried to prevent it by attending the October 2001 court hearing at which the administration order was made. "If I had seen the papers in advance, I would certainly have intervened," said Mr Winsor. Mr Winsor said in a memo attached to his witness statement that he was invited to dinner by the transport secretary in February 2002. Mr Winsor recorded in his memo that he had discussed with Mr Byers the events leading up to the making of the administration order. How can 50,000 go to court? "He said that, in that respect, in the summer of 2001 he had been looking through the Railways Act and it was he, not officials, who had first had the idea of putting Railtrack into administration." Mr Winsor said he was surprised by this because the administration regime in the act was to enable the secretary of state to "react to the insolvency of a protected railway company". "It is not a means of taking out a railway company with which the government has lost patience and having its assets transferred to another company more to the government's liking," he said. In another attendance note, Mr Winsor recorded his meeting with the then permanent secretary at the transport department, Sir Richard Mottram, three days after the administration order had been made. He told Sir Richard the government's forcing of Railtrack into administration was "grubby and disreputable" and that, when the facts came out in full, it would have difficulty defending itself. Sir Richard countered that Railtrack was a failed company and the government had to do something about it. The government had taken a lot of legal advice and was very confident of the legality and propriety of what it had done, he said. The critical question in the case is whether the company - since replaced by the state-backed Network Rail - simply ran out of money or whether the government plotted its downfall. The case is being led by the Railtrack Private Shareholders Action Group (RPSAG), which has raised £2.4m to bring the matter to court. If the High Court finds in favour of the shareholders, then there will be a second trial to quantify damages. Railtrack was formed in April 1994 after the privatisation of the UK railway network by the then Conservative government of John Major. It was floated on the London Stock Exchange in 1996. How can 50,000 people go to court? How can rail privatisation be turned into a play?